iOS, formerly known as iPhone OS, is a mobile operating system created and developed by Apple Inc. exclusively for its hardware like iPhone, iPad and iPod Touch. It is the second most popular mobile operating system globally after Android. But nothing is perfect, iOS system is no exception. There are always kinds of different problems come into being when you use the iOS system. While many problems can be solved simply by restarting or force rebooting, there still some stubborn and unsolvable iOS issues.Therefore, to repair your iPhone to normal, you must resort to some iOS repair software for help. So, what is iOS repair software? It is specially developed to fix various notorious iOS problems such as like black screen of death, stuck on white Apple logo, update failure, iPhone frozen, etc. Since there're so many iOS repair tools in the market, how to pick the most suitable one? Now we will introduce 4 popular iOS repiar tools and respectively outline the advantages and disadvantages of them to you. Now keep on reading and choose one that fully meets your needs. 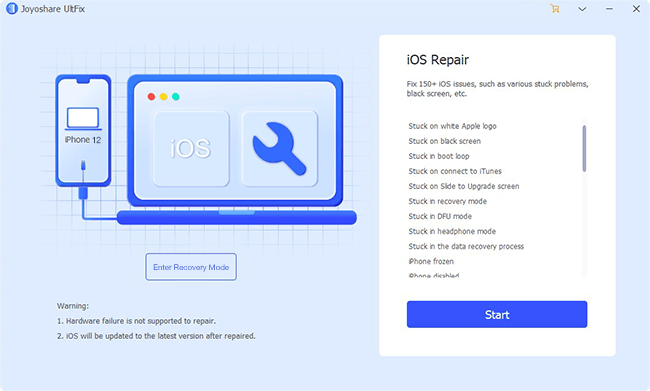 Joyoshare UltFix (iOS System Recovery) is an extraordinary iOS repair specialist that offers option to fix 30+ common iOS issues, such as iPhone won't charge, iPhone failed to update, iPad is disabled connect to iTunes, etc. blue screen of death, iPhone keep restarting, etc. You can fix your iOS device to normal within 3 simple steps: connect iPhone to computer, download and verify the firmware package, repair iOS problems. 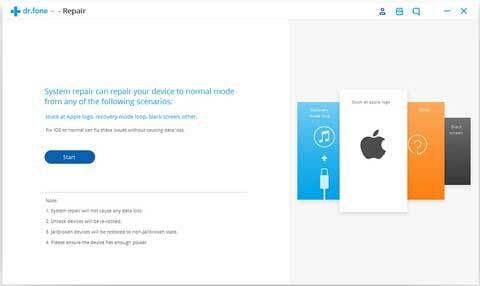 With its help, you can use 2 modes (Standard Mode & Advanced Mode) to either fix iOS problems without data loss or factory reset iPhone without sparing efforts. Besides, its full compatibility to the latest iOS 12 and a series of iOS devices also makes it anideal tool for Apple users. iMyFone Fixppo (iOS System Recovery) is a professional iOS repair tool that designed to get your iPhone back to normal. It supports all iOS versions and devices including iOS 12.1 and the newest models of iPhone/iPad/iPod touch. You can easily fix the iOS issue on your device with just a few clicks at home. When your iPad or iPhone stuck in recovery mode or white Apple logo, things like that, the general method of recovery for your iPhone/iPad is an iTunes restore. Great if you have performed a backup and tragic if you don't. This is where dr.fone - Repair comes out. It can easily fix any kinds of iOS system issues and get your device back to normal. Mostly importantly, you can handle it by yourself within less than 10 minutes and won't lose any data. 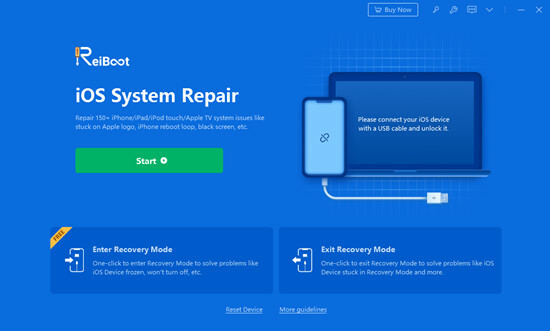 Another available iOS repair tool introduced here is named ReiBoot from Tenorshare. It is a useful utility to repair various iOS problems such as iPad stuck on DFU mode, iPhone keep freezing, screen won't turn on, and other issues that you can't identify. It's worth mentioning that this program allows you to recover your iOS system to normal stutas without causing any data loss. 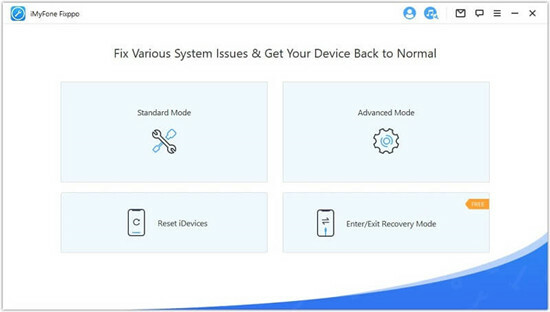 In addition, the trial version allows you to enter or exit the recovery mode in one click free of charge. The following table will give you a much more clearer comparsion among these 4 best iOS repair programs, so that you can select the most suitable one you want. As a regular iPhone user, your iPhone will at times and out of the blues, develop some abnormal behavior that will prevent you from using your phone as usual. The above iOS repair software reviews are helpful to Apple users who have issues with their phones and do not know which firmware is suitable to fix the problem. As outlined in the different methods, each firmware is simple and easy to use, and they are compatible with a variety of iPhones and their versions. You are now in a better position of knowing what to do when your phone has some iOS related glitches that need fixing. As we said before, everyone has different criteria for defining whether a tool is the best one, maybe its price or its function, or some other things. Feel free to decide which one you are going to choose, or you can also take your device to any of Apple's official store when you have an insurmountable difficulty, they'll give you a hand.